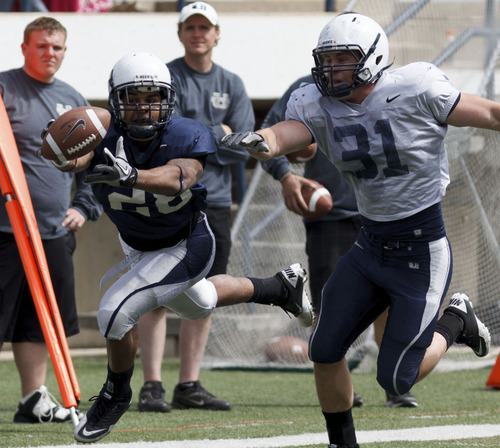 USU football • Both Keeton, Kennedy look strong in scrimmage. 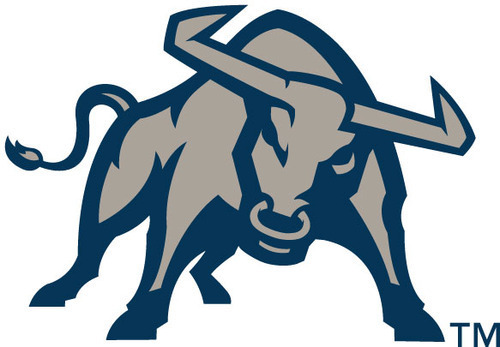 Utah State 2012 logos. 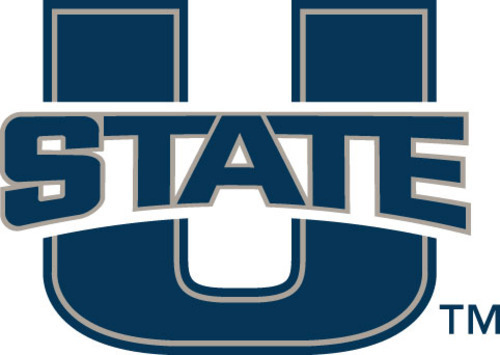 Courtesy image Utah State 2012 logos. Courtesy image Trent Nelson | The Salt Lake Tribune Running back Joey DeMartino stretches out for the ball but comes up short at Utah State's annual Blue and White football game Saturday, April 28, 2012 in Logan, Utah. Defending is Parker Hausknecht Trent Nelson | The Salt Lake Tribune Running back Joey DeMartino stretches out for the ball but comes up short at Utah State's annual Blue and White football game Saturday, April 28, 2012 in Logan, Utah. 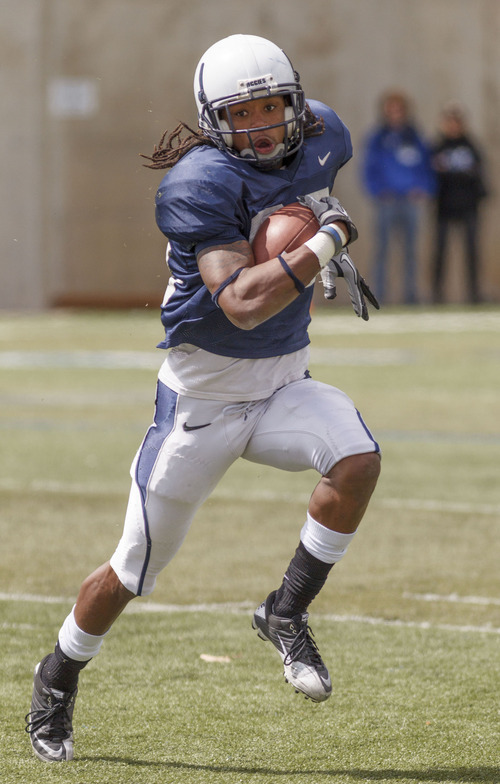 Defending is Parker Hausknecht Trent Nelson | The Salt Lake Tribune Running back Tavarreon Dickerson runs the ball at Utah State's annual Blue and White football game Saturday, April 28, 2012 in Logan, Utah. Trent Nelson | The Salt Lake Tribune Quarterback Chuckie Keeton at Utah State's annual Blue and White football game Saturday, April 28, 2012 in Logan, Utah. Trent Nelson | The Salt Lake Tribune Fans at Utah State's annual Blue and White football game Saturday, April 28, 2012 in Logan, Utah. Trent Nelson | The Salt Lake Tribune Utah State head coach Gary Andersen at Utah State's annual Blue and White football game Saturday, April 28, 2012 in Logan, Utah. Trent Nelson | The Salt Lake Tribune Quarterback Adam Kennedy at Utah State's annual Blue and White football game Saturday, April 28, 2012 in Logan, Utah. 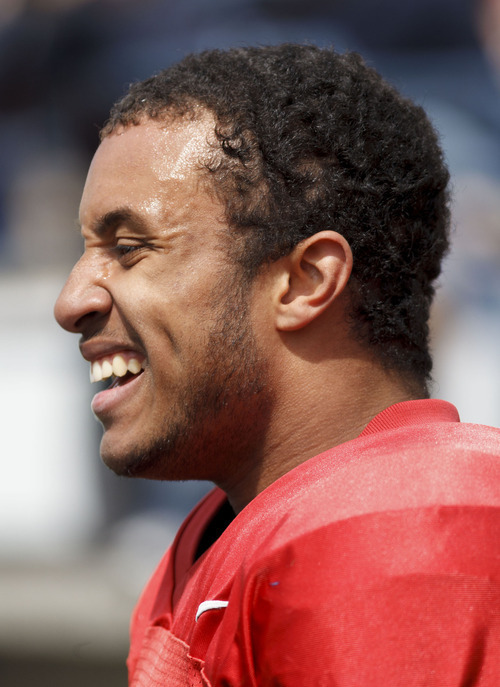 Trent Nelson | The Salt Lake Tribune Defensive lineman B.J. 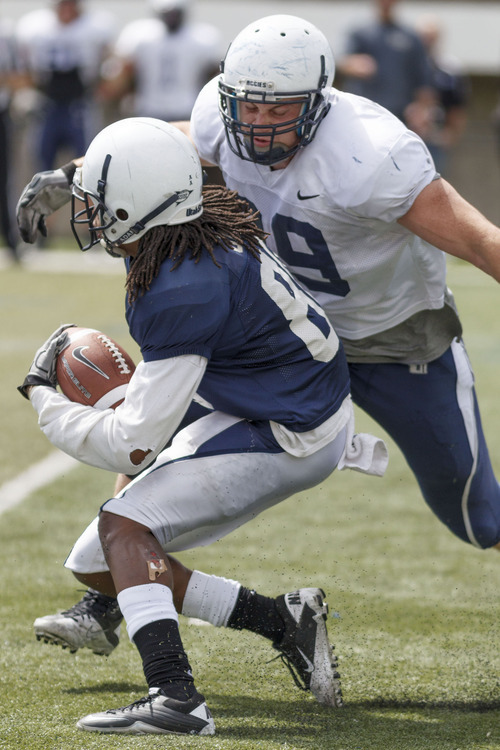 Larsen moves in to tackle Chuck Jacobs at Utah State's annual Blue and White football game Saturday, April 28, 2012 in Logan, Utah. Trent Nelson | The Salt Lake Tribune Receiver Travis Reynolds celebrates a first half touchdown at Utah State's annual Blue and White football game Saturday, April 28, 2012 in Logan, Utah. 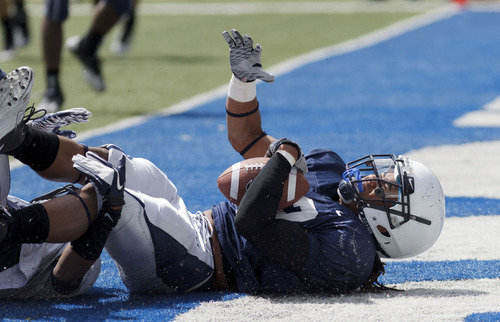 Trent Nelson | The Salt Lake Tribune Receiver Jordan Jenkins scores a touchdown at Utah State's annual Blue and White football game Saturday, April 28, 2012 in Logan, Utah. 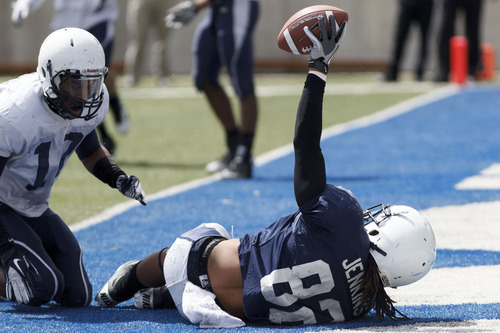 Trent Nelson | The Salt Lake Tribune Receiver Jordan Jenkins scores a touchdown at Utah State's annual Blue and White football game Saturday, April 28, 2012 in Logan, Utah. Trent Nelson | The Salt Lake Tribune Receiver Jordan Jenkins runs for yardage at Utah State's annual Blue and White football game Saturday, April 28, 2012 in Logan, Utah. Trent Nelson | The Salt Lake Tribune Receiver Jordan Jenkins celebrates a touchdown at Utah State's annual Blue and White football game Saturday, April 28, 2012 in Logan, Utah. Logan • According to Gary Andersen, Chuckie Keeton and Adam Kennedy are locked into a battle to be Utah State's starting quarterback for the second consecutive year. 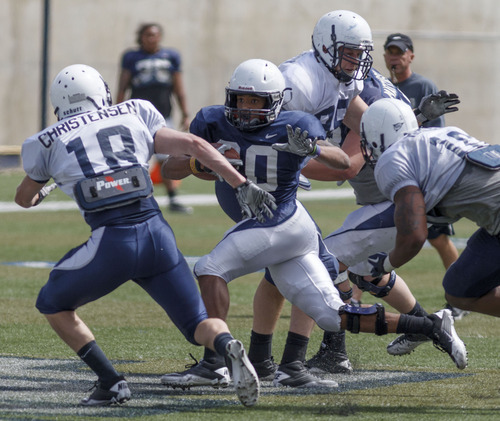 And while no decision will be made on their status until fall practice commences, USU's spring game made one thing abundantly clear: Whoever does start will have plenty of weapons to work with. 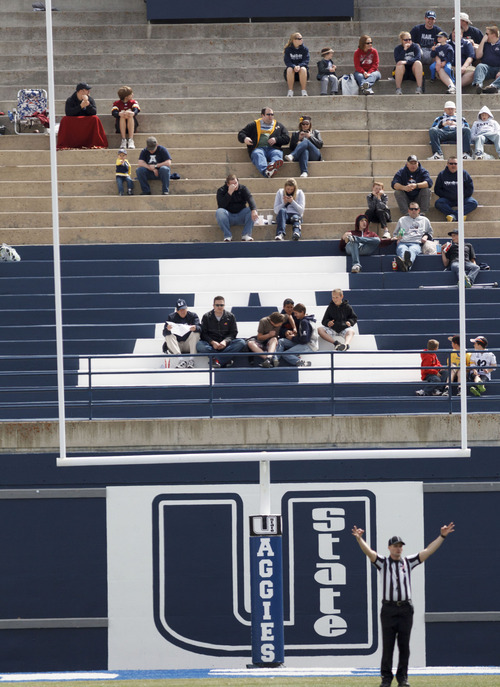 Saturday's scrimmage, before a huge crowd at Romney Stadium, put the spotlight on a potentially explosive Utah State offense. There was Keeton, a better thrower than his freshman year, tossing perfect strikes on seam routes, moving the Aggies down the field with aplomb. There was Kennedy showing the calm and poise that made him a hit when he took over for Keeton midway through 2011. There was Kellen Bartlett, the tight end who missed last season with a broken leg, catching everything thrown his way and stretching the field. 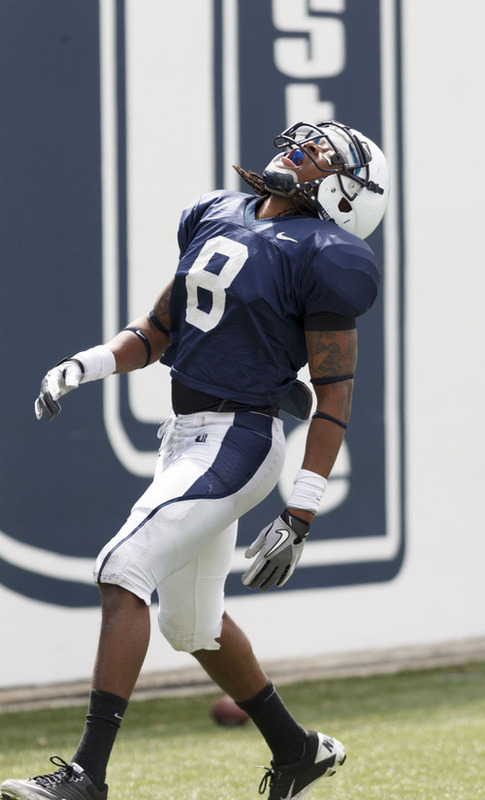 There was receiver Chuck Jacobs, running better routes and showing off his striking athleticism. "It was a good day out there for the offense," Keeton said. "We started slow, but when we picked it up, we got things rolling. It was fun to be out there today. Kellen Bartlett did an amazing job. And we have a stable of running backs and tight ends that can get the job done." 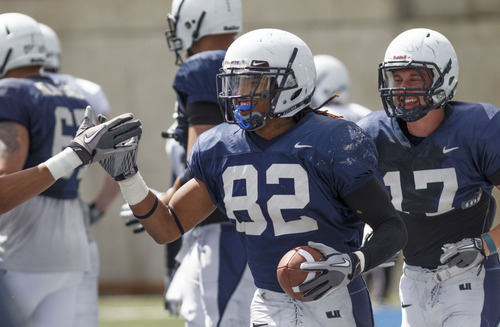 Utah State didn't have all of its first-team players available on Saturday. Neither running back Kerwynn Williams nor receiver Matt Austin played a down. Yet, in 75 snaps, USU rolled up 330 yards of passing offense and 482 yards of total offense as the Blue team narrowly defeated the White team. Jacobs, Travis Reynolds and Jordan Jenkins all caught touchdown passes. Joe Hill, true freshman Tavarreon Dickerson and Joey DeMartino all ran well with the football. 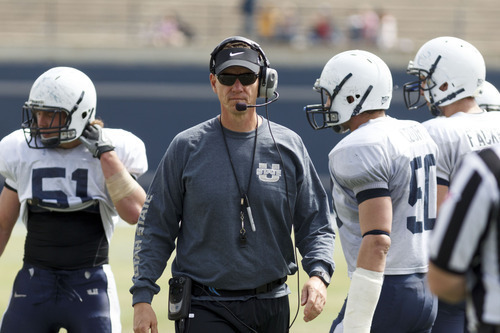 Utah State's shiny new spread offense highlighted the many options the Aggies have for the upcoming season. On a day where Robert Turbin and Michael Smith both went in the NFL Draft, USU showed that it may not miss too many steps without its two star running backs. "Right now, our offense is strong," Andersen said. "We have talented tight ends. Travis Reynolds is growing into his own as a wide receiver. We all know what Matt Austin can do, and Chuck Jacobs is growing into his own. There are some weapons on our team, and hopefully we'll have two or three more weapons who aren't here yet. We're excited about it. This summer will be big." Keeton and Kennedy have battled all spring. On Saturday, both were good. Keeton went 16-of-25 for 187 yards and two touchdowns, showing the scrambling ability that made him dangerous as a rookie, but also better mechanics and better ability to make reads. Kennedy threw a touchdown and an interception, but was an efficient 16-22 for 143 yards. The offense moved well under their direction. Both looked better than they were last season. "It's definitely a battle and it will go back and forth," Kennedy said. "We both have our days where we one-up each other. We're splitting reps 50-50. It will go into fall, just like last year. But we knew that going in." 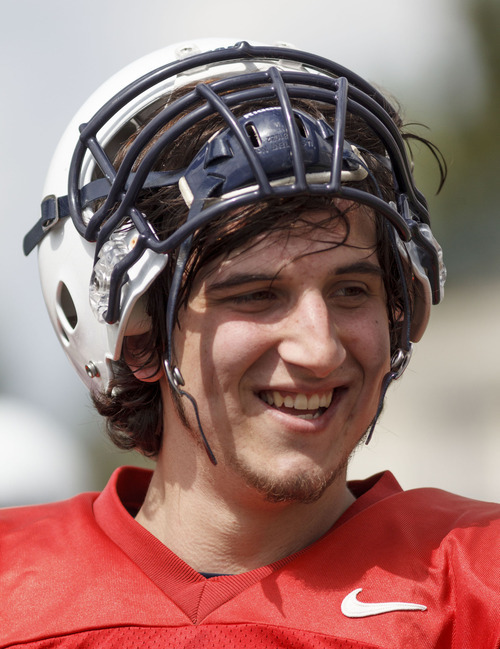 R Freshman Kyler Fackrell has two sacks and looks like a pass-rushing specialist at outside linebacker. • Senior cornerback Terrence Alston comes up with a huge interception in man coverage against receiver Chuck Jacobs.